The diverse historic buildings of Cedarburg include in 1850s mill and a 1920s pagoda-inspired gas station. Cedarburg, Wisconsin, (population 11,169) is situated on Cedar Creek, just 20 miles north of Milwaukee. German and Irish immigrants first settled in Cedarburg in the 1840s and built dams to harness the energy of Cedar Creek in order to manufacture textiles and grind grain. Cedarburg’s original settlers used the nearby Niagara limestone quarry to construct many churches, homes, and mills of cream-colored brick, unifying the city’s architecture. When the railroad arrived, it ushered in such large industries as a lumber mill, flour mill, woolen mill, brewery, and nail factory. 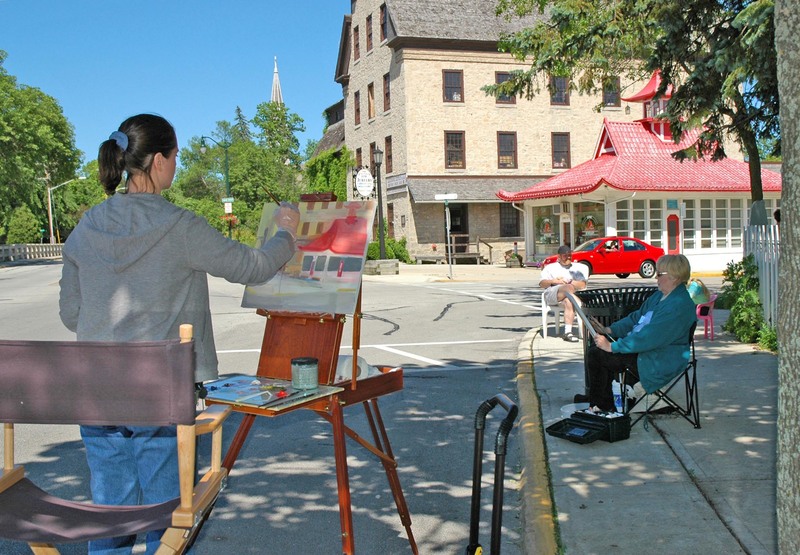 Today, Cedarburg’s economy thrives on tourism related to its historic properties and active community of regional musicians, artists, and performers. The Ozaukee Interurban Trail, a 30-mile biking, walking, and skiing trail that passes through Historic Downtown Cedarburg attracts thousands of visitors to the city. Cedarburg’s downtown Washington Avenue area is listed on the National Register of Historic Places, with more than 100 buildings considered historically significant. The adjacent Columbia Road Historic District is listed on the National and State Registers of Historic Places and includes nearly 130 significant structures. A self-guided walking tour allows visitors to view many of these properties. Cedarburg’s attractions include the new Wisconsin Quilt and Fiber Arts Museum, housed in a stone farmhouse on an 1850s sheep and dairy farm, and the Cedarburg General Store Museum. The town’s annual Strawberry Festival features a fine arts fair on Historic Washington Avenue; the annual Wine and Harvest Festival in September includes wine tasting and tours at the Cedar Creek Winery and a grape-stomping competition.